Heavy gauge aluminum will not stain or tarnish and provides a non-porous hygienic surface ideal for indoor environments. Telescoping lid neatly conceals the trash bag underneath overlap to help maintain a professional appearance. 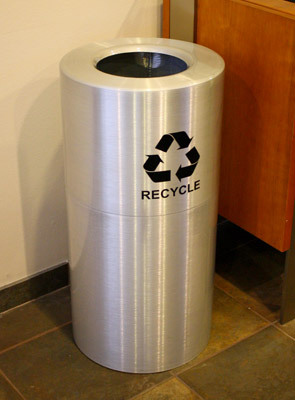 Bold "recycle" graphic decal clearly identifies the can as a part of a recycling program. 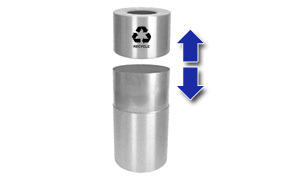 Disposal openings measure 8-1/4" Dia. for the 24 gallon and 9" Dia. for the 35 gallon units. Satin clear coat finish is free from blemishes and spinning lines.